Appendix A, "User Requirements Specification for DreamHome Case Study" of Database Systems: A Practical Approach to Design, Implementation and Management (6th edition). 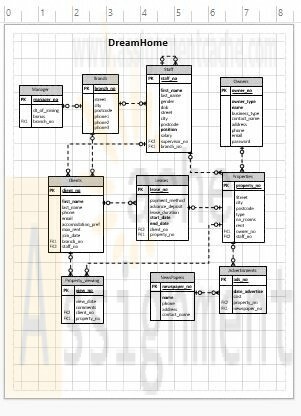 Review the "User Requirements Specification for DreamHome Case Study" of Database Systems: A Practical Approach to Design, Implementation and Management. Design a distributed database for DreamHome and illustrate it in Microsoft Visio. Note: The results of this assignment will be used in future DreamHome-related Individual Assignments in Weeks Two, Three, Four, and Five. Submit the Microsoft Visio files to the Assignment Files tab.